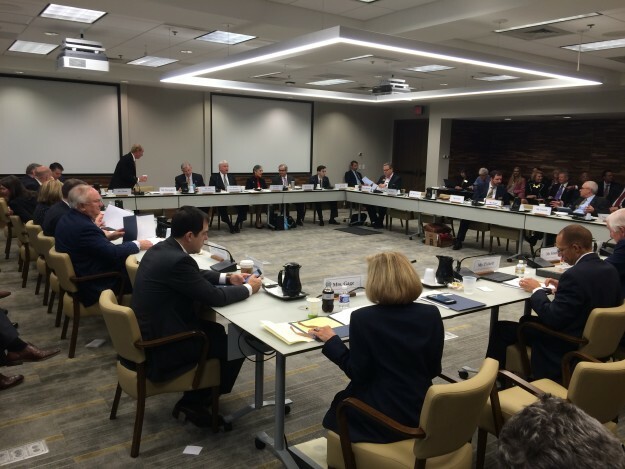 The UNC System Board of Governors attempted to go about its business in a normal fashion on Friday morning but was interrupted by protests. Protesters gathered outside before the Board of Governors meeting on Friday morning objecting to the selection of Margaret Spellings as the new System President. Some of those protesters made their way into the meeting and did not take very long to make their voices heard. As the roll was being called, UNC geography professor Altha Cravey began reading a script from the group Faculty Forward voicing opposition to Spellings. 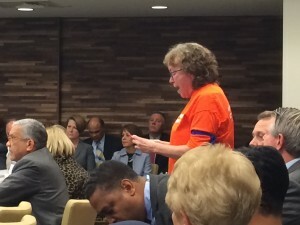 UNC Professor Altha Cravey protesting during the UNC Board of Governors meeting. Photo via Blake Hodge. Cravey was escorted out by UNC Police. One-by-one, six other protesters stood up and picked up the script where the one prior had left off while being escorted away. The protesters were greeted by cheers from the near 100 others gathered in the lobby, who were shouting throughout the board meeting – loudly enough to be heard through the closed doors. Two board members, Marty Kotis and Steve Long, expressed frustration with the continued shouting throughout the meeting and asked what disciplinary sanctions could be pursued, specifically against faculty members. Board chair Lou Bissette says that he does not believe those sanctions will be sought by the board. The protesters were issued a warning for trespassing but no arrests were made. Michael Behrent is an associate professor of history at Appalachian State University. He was one of the faculty members escorted out of the meeting. “We went into the Board of Governors with clearly laid out statements explaining why we think the Board of Governors not only made a serious mistake that does disservice to the people of North Carolina by appointing Margaret Spellings but also hired her in a completely untransparent way,” he says. He says that goes against North Carolina values. Spellings, who served as U.S. Secretary of Education under George W. Bush, was not at the meeting. 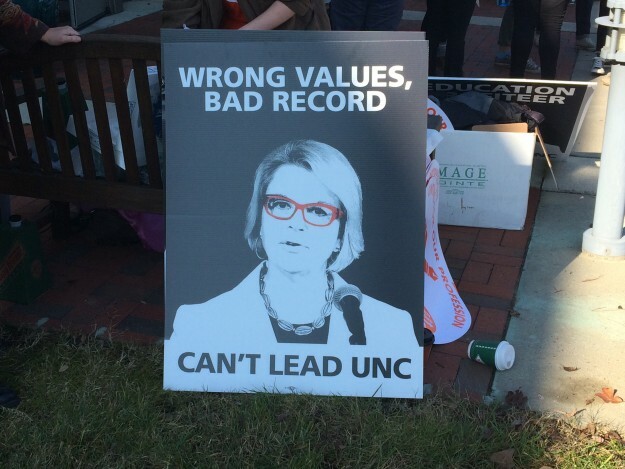 One of many signs at UNC Board of Governors meeting protesting hiring of Margaret Spellings as System President. Photo via Blake Hodge. Behrent says the mission of the protesters Friday was to bring their message to the citizens of the Tar Heel state. He adds he knows it will be very difficult to keep Spellings out of the President’s role. Bissette says the 32-member board is not interested in moving toward privatization of the UNC System. Outgoing President Tom Ross says he will be doing everything he can to ensure Spellings is successful leading the university system. “I think the university deserves that,” he says. “I would say that to the faculty that this is the President that the board has selected. And she is the leader of the university. And we all need to make sure that she gets the support she needs to be successful, because the university depends on that. Ross adds it is “no secret” that he would like to keep serving as President but says it is the board’s prerogative to choose a new leader. Ross adds he thinks it is important for everyone, including faculty, to keep perspective on this appointment. “She applied for or was recommended for, I don’t know which because I wasn’t involved in the search, for the job,” he says. “And whatever the noise is around how the process was done, whatever the concerns are about what happened that created the opening for the job, she didn’t have anything to do with that. Friday marked Ross’ last meeting leading the board. His last day in the position will be January 3, 2016. Current senior vice president for academic affairs Junius Gonzales was selected as the Interim President to serve as the bridge between Ross’ departure and the arrival and installment of President-elect Spellings on March 1. The board also unanimously elected Lou Bissette as the new board chair. Bissette joined the board in 2011 and was appointed to a second four-year term earlier this year. He has served as vice chair under John Fennebresque, who resigned earlier this year after drawing criticism over the search process that led to the election of Spellings.